3 Columns is a study in the repetition of identical forms and their relationship to space and gravity. View Susan York’s bio on Lannan.org. The project represents a challenging increase in scale and scope for York. 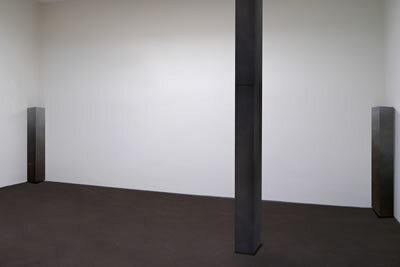 Two six-foot high graphite forms will hang in the corners of the space and one stacked fourteen-foot hanging column will float in the gallery, placed slightly off-center. The 800 pound hanging column will float only a few inches above the floor, suspended from a beam above the gallery. The surfaces of the graphite forms are richly modulated and highly polished. 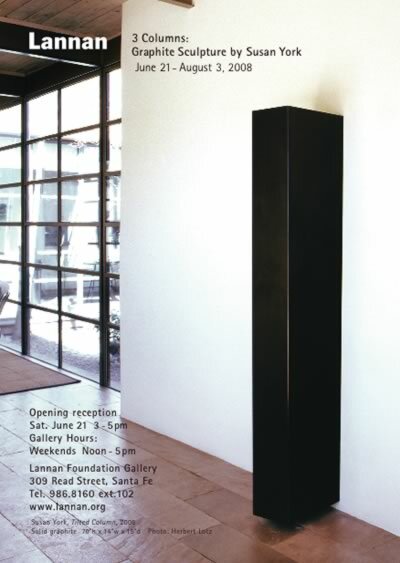 Additional drawings and sculpture by York, including Tilted Column (2008) will also be shown at the Lannan gallery. A catalogue will be published in conjunction with the exhibition with essays by Lucy Lippard and Diane Karp. York’s previous installations include Center of Gravity (2001-present), a series of site-specific immersive works consisting of rooms completely covered in polished graphite with graphite forms placed on the floor. In describing York’s earlier work in Art in America, Sarah S. King wrote that her “striking body of work and systematic methods . . . adroitly provoke tensions between space and form.” York has also created site sensitive works in galleries; installing graphite sculpture and drawings to create subtle tensions between the sculpted and drawn forms and the physical, architectural space. York’s austere and contemplative graphite objects are set within the gallery to induce a formal and perceptual experience for the viewer. The specificity of each of the artist’s installations creates a numinous state of quiet and resonant beauty. 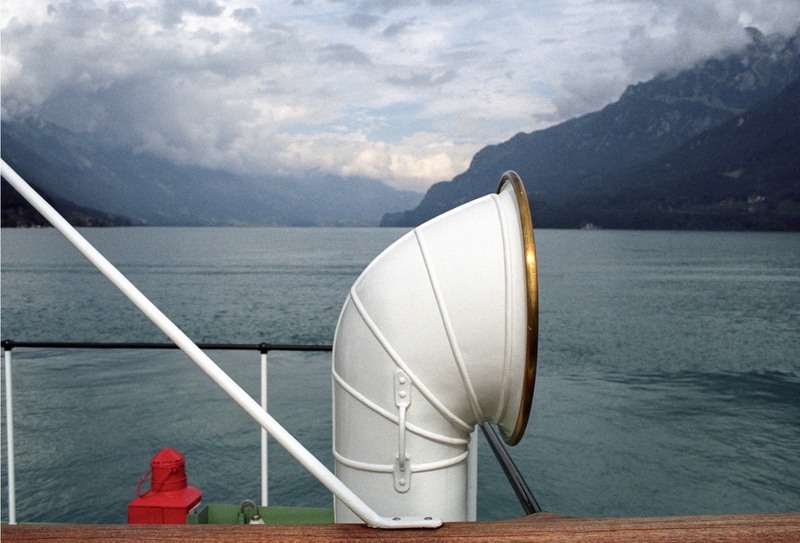 Susan York’s work is represented in the collections of the Lannan Foundation, Santa Fe, New Mexico; the Panza Collection, Lugano, Switzerland; and the Stedelijk Museum, the Netherlands. She is a 2007 recipient of a Joan Mitchell fellowship for Painters and Sculptors.